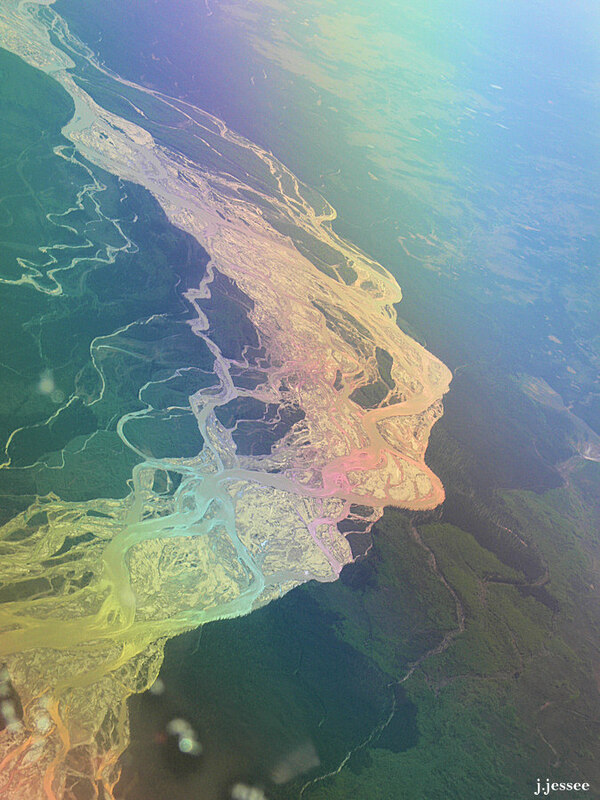 Flying into Fairbanks one day in 2008 the airplane took an unusual route. 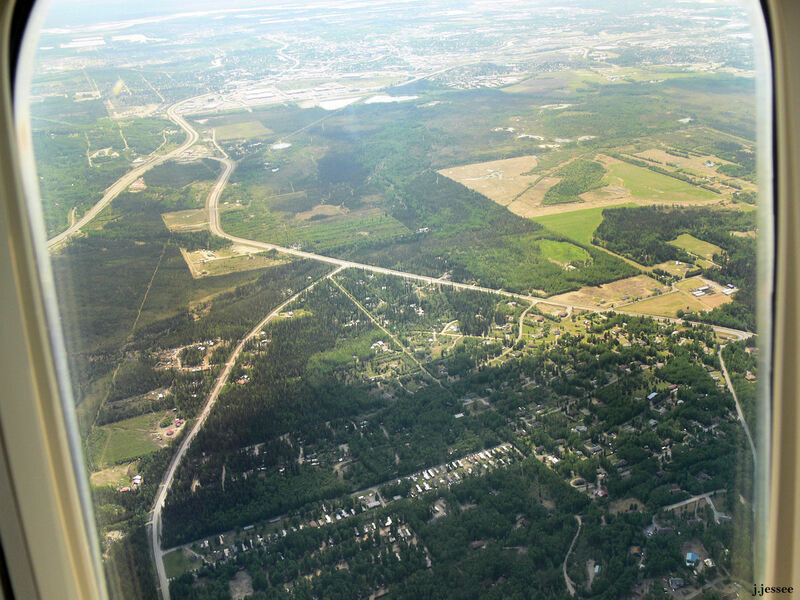 Instead of coming in from the southwest it came in from the southeast, flying over Harding Lake and Salcha and circling over Farmers Loop across north of town into the airport. 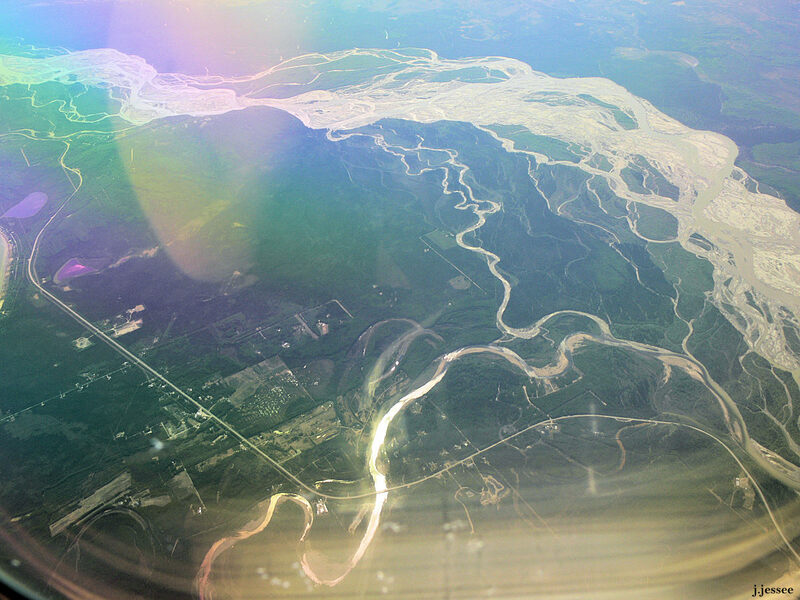 Maybe this direction of landing is normal, I don’t know, I have never experienced it before, but this day happened to be beautifully clear and I captured some great photos of the Tanana River and various Fairbanks landmarks. Click on the first one and then scroll to the right for an overhead, raven’s eye, tour of Fairbanks. 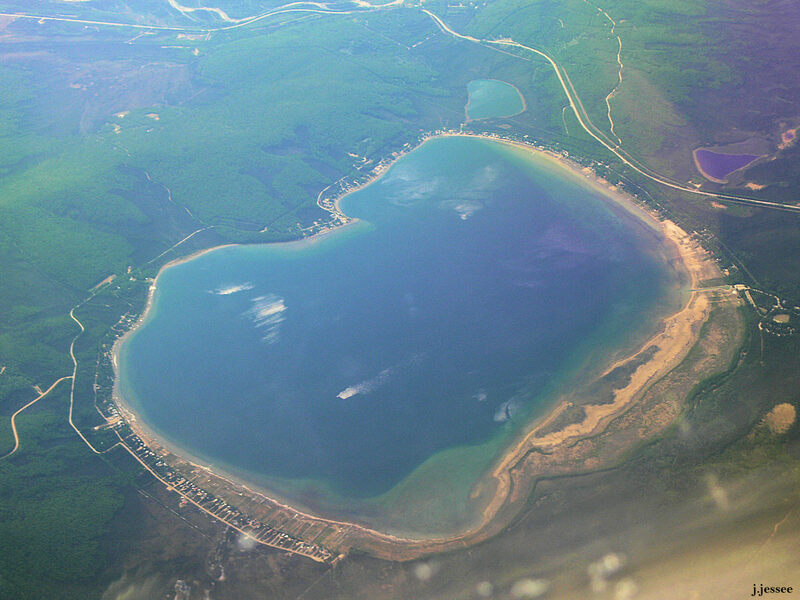 This is Hardling Lake with the Richardson Highway at the top of the photo (looking south). 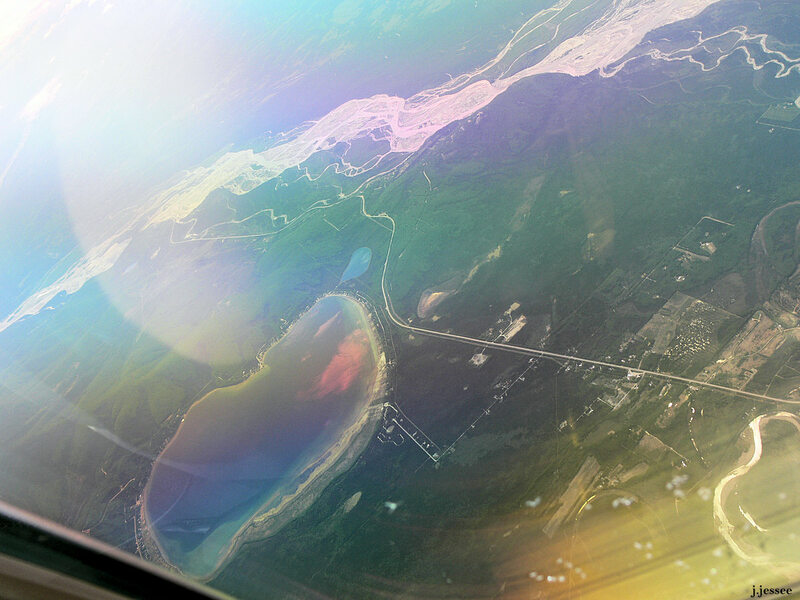 Harding Lake with the Tanana River and Richardson Highway running in between. This is the Salcha River flowing into the Tanana River, surrounded by the community of Salcha with the Richardson Highway running through it. Now we are looking northwest toward Fairbanks with the Tanana River flowing westward. 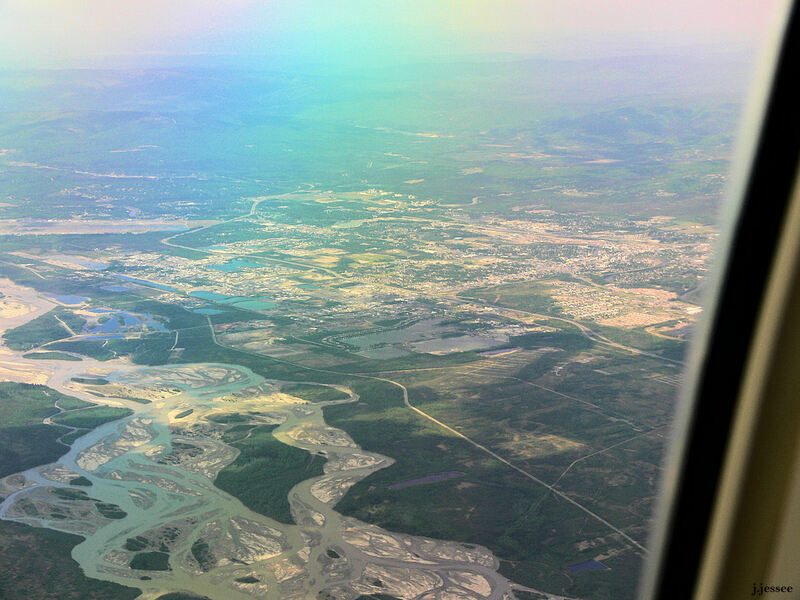 A closer view of Fairbanks with Fairbanks International Airport in the upper left, above the Tanana River. 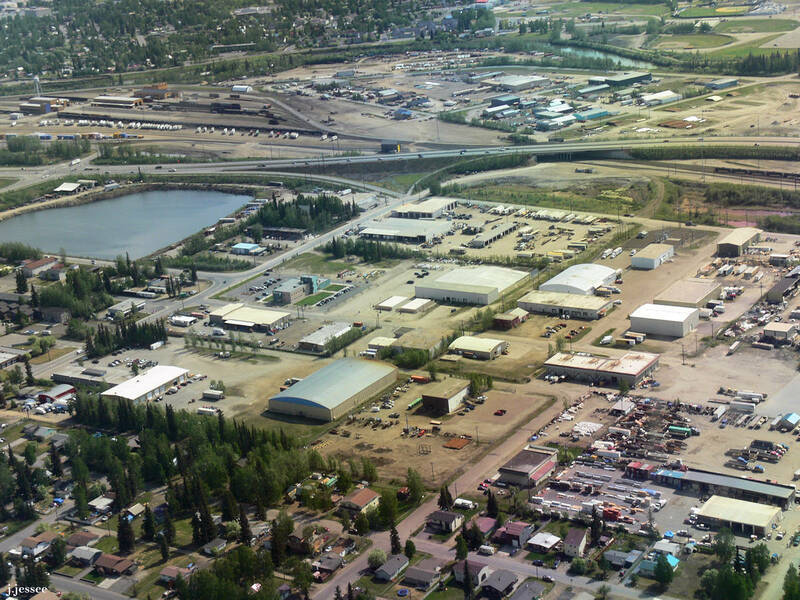 The Parks Highway runs next to the airport from the northwest then turns east (Mitchell Expressway). 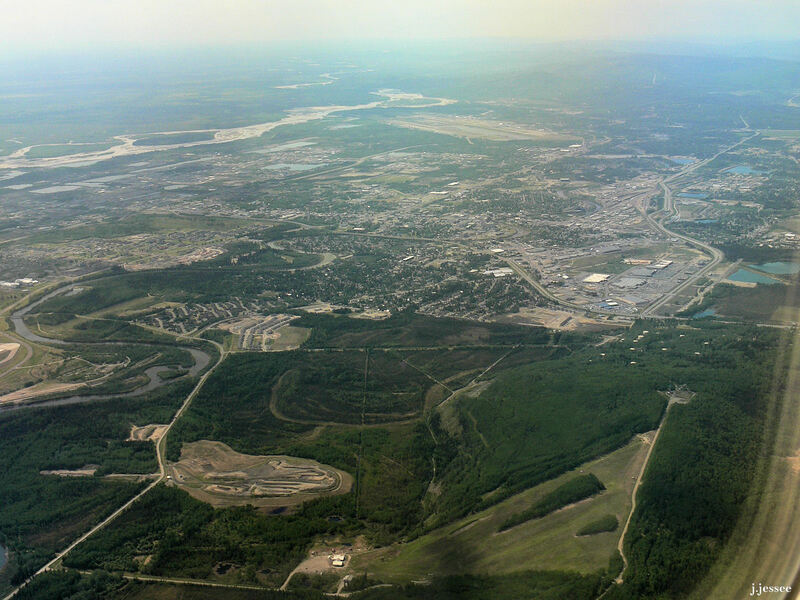 You can see almost all of Fairbanks here including the hillside residential areas to the north and west. 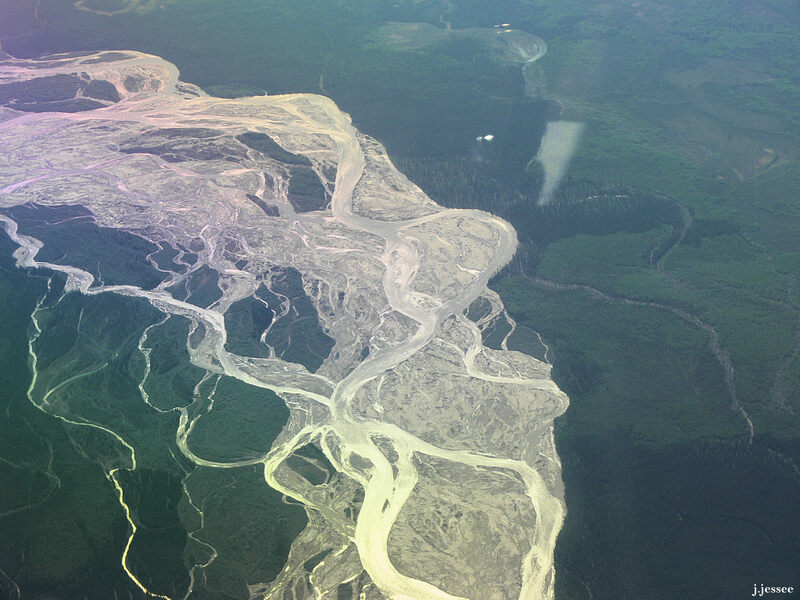 The bodies of water in between Fairbanks and the Tanana RIver are the gravel pits around Lakeview Terrace and farther away, the South Cushman ponds. The intersection of the Richardson Highway and Badger Road is on the right. The road that parallels the Richardson on the left is called Saddle Avenue; we think this is the dike that protects Fairbanks from Tanana River flooding. Fort Wainwright is on the right. 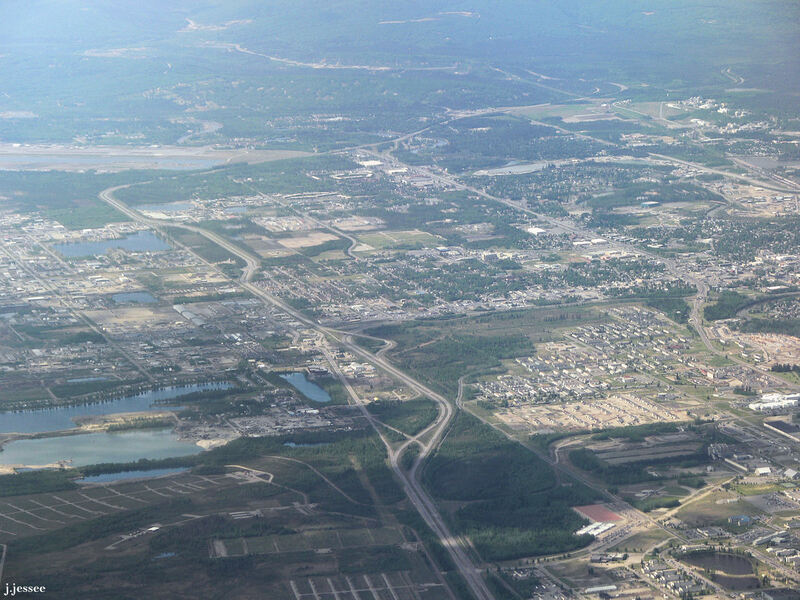 The middle rectangle spans south Fairbanks from the airport to Fort Wainwright. The University of Alaska is in the upper right hand corner and below it is part of downtown. Now we are on the other side of Fort Wainwright looking southwest. Bottom right is Birch Hill Recreation Area and downhill ski runs and Jack says the circular cleared area is the Fort Wainwright landfill. On the right side middle you can see Johansen Expressway with the big box stores along it, though it’s more developed now with large commercial buildings on both sides of the road instead of just one. 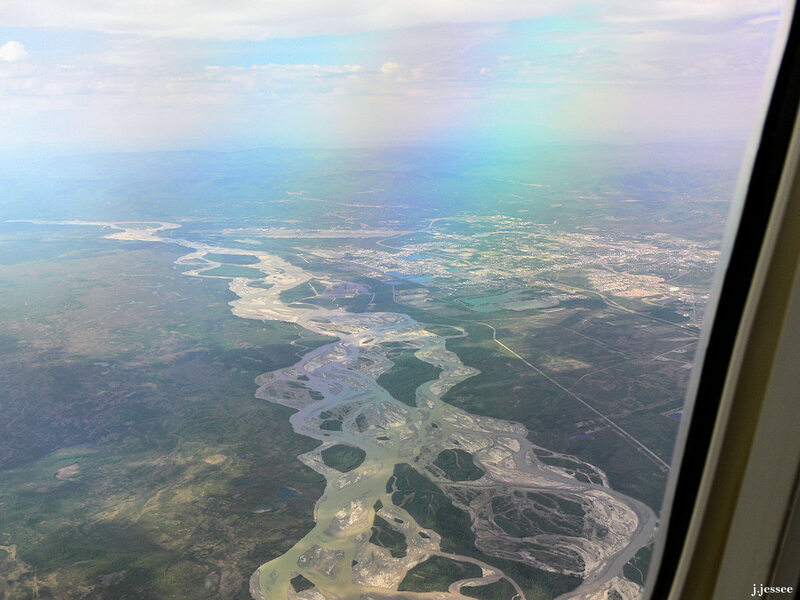 The Chena River winds westward from Fort Wainwright. 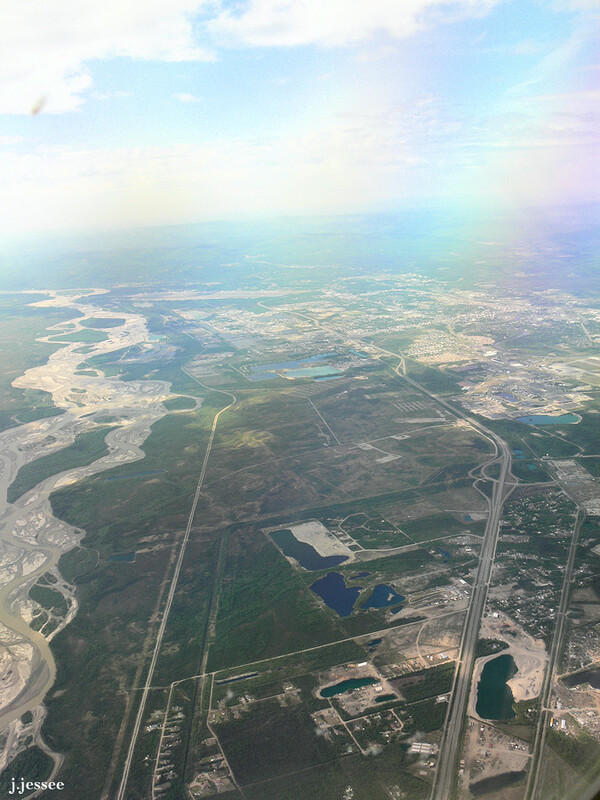 We’re flying north of town now looking south toward Fairbanks with the intersection of Farmers Loop and the Steese Highway in the upper left corner and McGrath and Farmers Loop closer to the middle. Someone’s personal junkyard, one of many in Fairbanks. Normally you can just see an edge but here you can see one in all its glory! 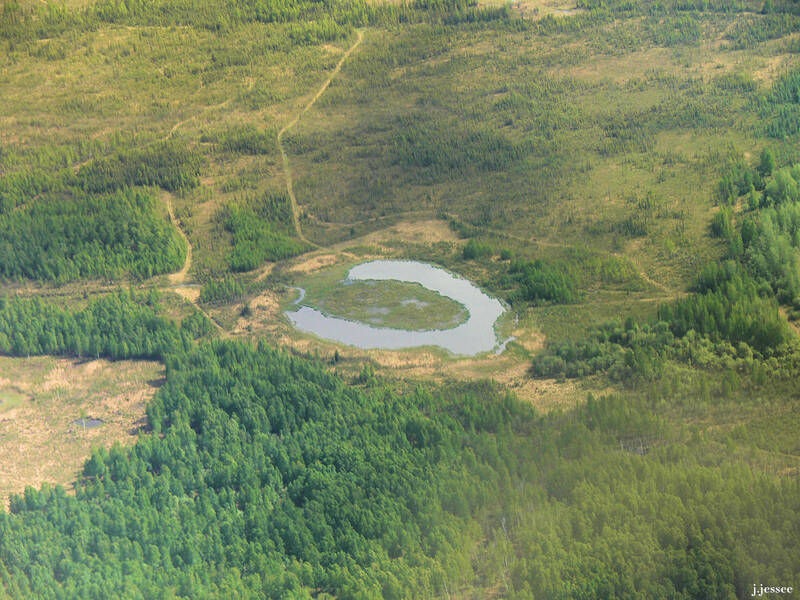 This interestingly shaped pond is either an oxbow lake, which is formed where a river or slough used to run, or a thawed area of permafrost. 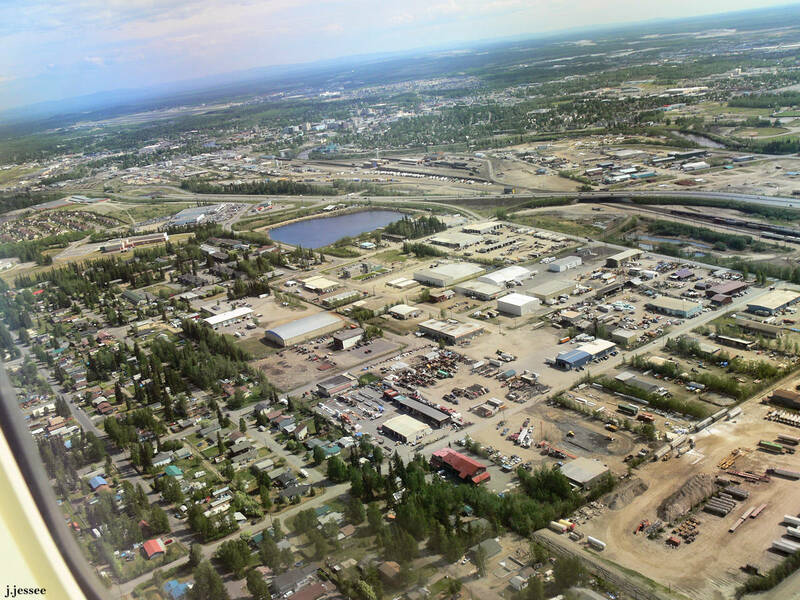 This is north Fairbanks where the industrial area of Aurora Drive and the residential areas north of it meet. Carlile Transportation is kind of in the upper middle, just on this side of the Johansen Expressway. Danby intersects Johansen in the upper left corner and on the other side of the expressway is the railroad industrial area. There have been a lot of changes since these were taken 6-7 years ago. We are farther west, looking southeast, with Johansen Expressway running horizontally. The large buildings in the upper left (not near the middle of the photo, that’s the Aurora Drive industrial area) are Randy Smith Middle School and the car dealerships of Danby Road. Next to the red roof in the foreground is the partially constructed foundation of the Carlile shop that now services Jack’s truck. 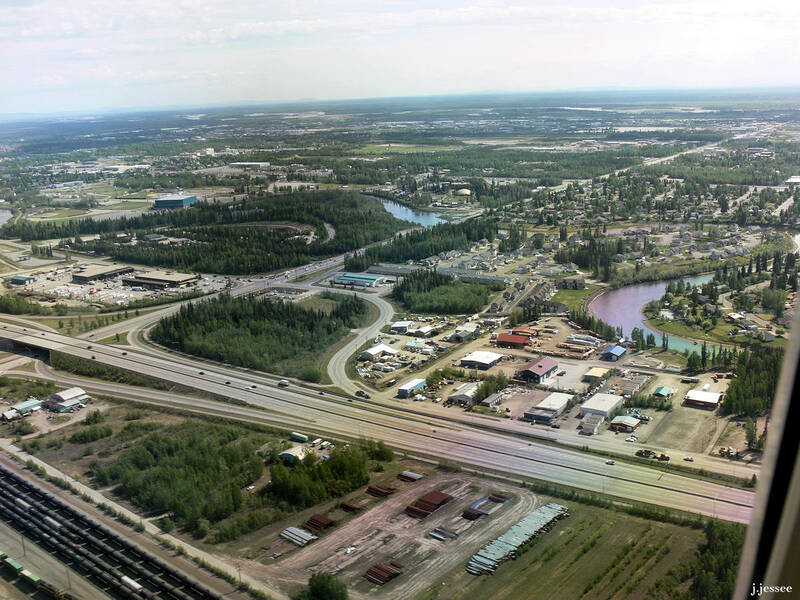 Here we see the Chena River meandering through Fairbanks and the intersection of Johansen and Peger Road on the left. The Carlson Center is the large green building in the upper left. 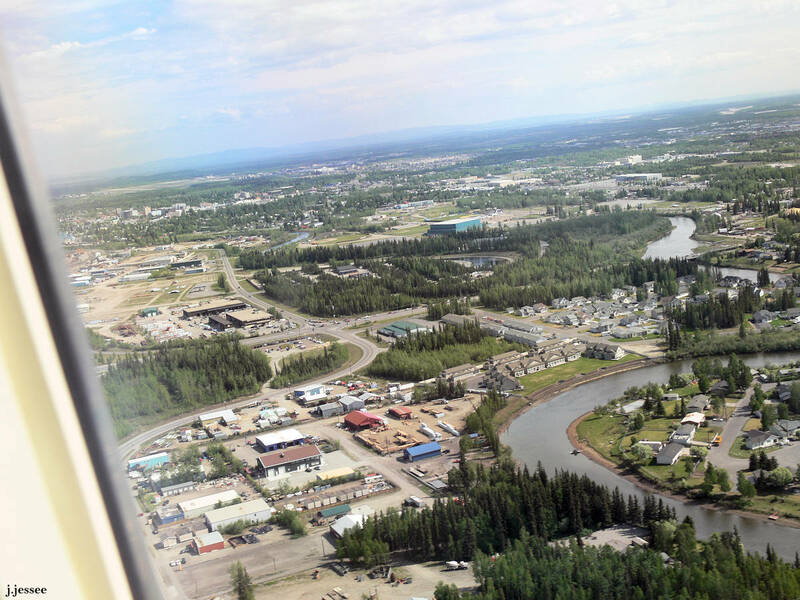 One of the newest and most expensive neighborhoods of Fairbanks is Doyon Estates which is on the right, inside one of the the loops of the Chena River. The intersection of Peger Road and Phillips Field Road is near the middle and here is where the railroad industrial area and the residential neighborhoods meet. 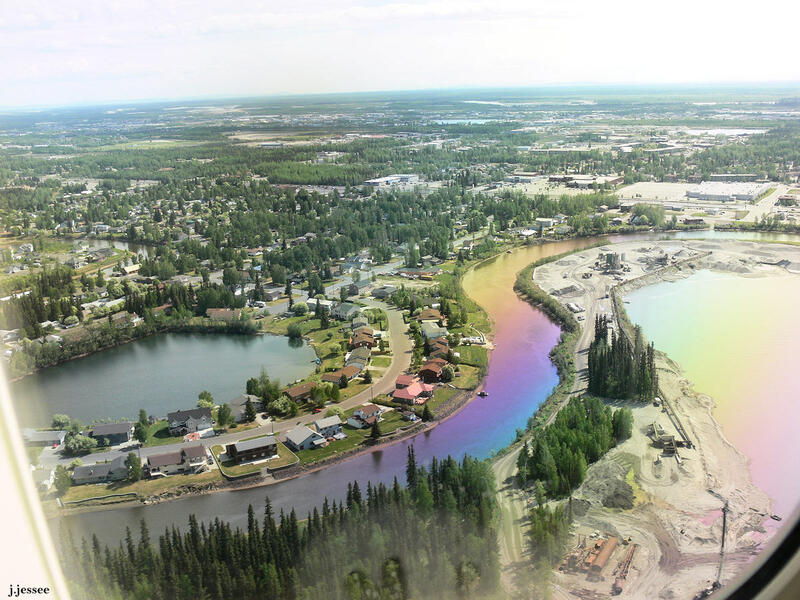 This is Riverview Drive running between the neighborhood pond and the Chena River, with an active gravel pit on the right bank of the Chena. This residential neighborhood is called Taku or Westgate. You can see the new intersection of Airport Way and Washington Drive in the upper right corner. The large building at the corner of that intersection has been shuttered since K-Mart closed, and next to it is Sears. 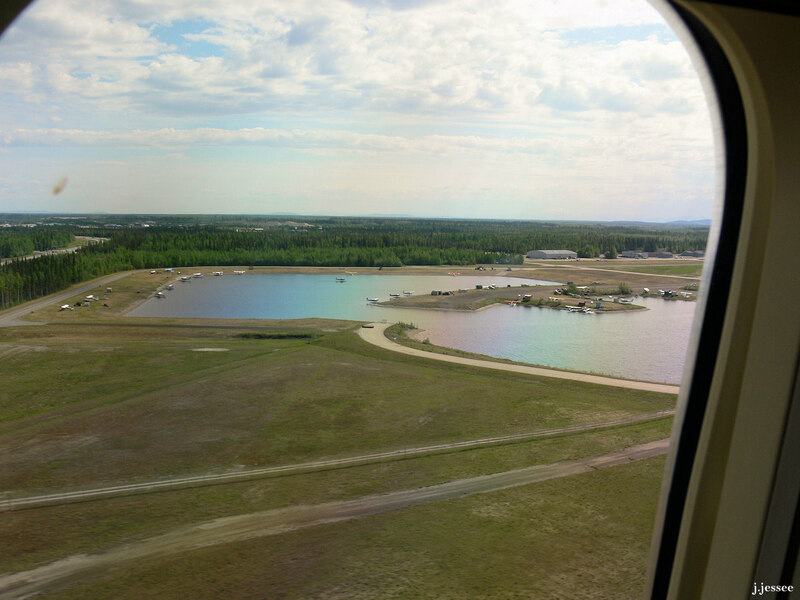 And finally, we land at the Fairbanks International Airport with the float ponds next to the runway. This entry was posted in Scenery and tagged alaska, Aurora Drive, badger road, Birch Hill Rec Area, Birch Hill Recreation Area, Birch hill ski, carlile transportation, carlson center, chena river, downtown Fairbanks, fairbanks, Fairbanks International Airport, farmers loop, Fort Wainwright, harding lake, highway, industrial area, Johansen Expressway, lakeview terrace, Mitchell Expressway, oxbow lake, parks highway, railroad industrial area, randy smith middle school, richardson highway, road, salcha river, ski hills, skiing, steese highway, tanana river, travel, UAF, University of Alaska, view from above, view from an airplane. Jack and Judy…I love looking at all the pictures. Thx for such an interesting page. Happy Valentine’s Day! Great pictures Jack. Thanks so much for sharing. Fans of yours, Charles & Linda Rogers Oroville, CA. Exactly, and on such a clear day! I got lucky. 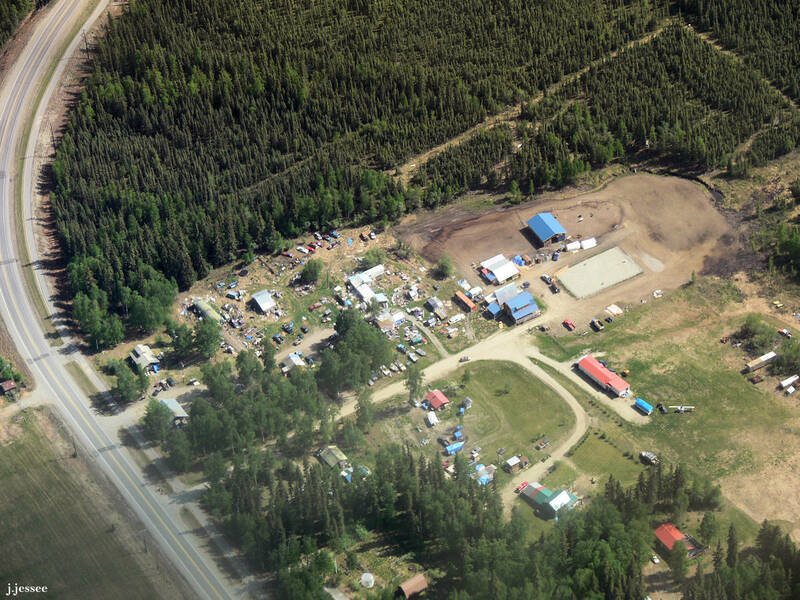 I loved looking at the aerial Fairbanks photos with description of what I was seeing. Thanks for sharing with us. It was such a treat to meet you at the Signpost Forest (in Watson Lake, Canada) a few years ago. Happy Valentine’s Day to you both! Yes we remember that! How nice. Thanks for finding us.